You get a bonus feature this week! This piece first appeared on the Reading Fringe site, although hopefully it’s a useful guide for all pre-theatre dining and not just the Fringe. When Zsuzsi from the Reading Fringe asked me to suggest five of the best restaurants to eat at before taking in a show at the Festival I was hugely honoured. Reading is enormously lucky to have such a terrific programme of events this month, and fortunately Fringe-goers are also lucky to have a great range of places to eat at beforehand, from sharing dishes and street food all the way through to proper sit-down meals. Here’s my selection – and in the spirit of the Fringe you won’t find a single large faceless chain in there. I hope you enjoy one of them, and that you enjoy the Fringe! Bali Lounge was closed as of January 2018. I’ve left the review up for posterity. When has a restaurant changed enough to be a new restaurant? Not necessarily when the chef changes, that’s for sure: chefs come and go all the time, whether it’s a steady throughput of chefs at a chain restaurant or the head chef leaving Forbury’s and being replaced by someone else. Not necessarily when they rebrand the menu, either – a good restaurant probably does this quite often. But when it closes for renovations and emerges from the chrysalis with new branding, a different menu and a different name, perhaps it’s time to look afresh. The Warwick ceased to be at the start of the year and reopened as Bali Lounge. The exterior was slightly different: no longer described as a pub but as a “Bar. Restaurant. Gallery”, no less. The menu was altered – slimmed down, with more emphasis on Indonesian food. Ever since then, I’ve been wondering: should I go back? Is it a new restaurant? The longer it went on the more I felt my old review of the Warwick might be misleading, and that’s why this week you’re reading this. Turning up on a weekday evening my first impressions were that the changes, such as they were, were on the subtle side. The interior looked much the same, the only concession being some newer, bigger, nicer looking tables. Curiously, the chairs were still the same and there were still at least three different types, just as there were at The Warwick. I got the impression that the management hadn’t quite wanted to start from scratch. The menu looked the same – the same faux-chalk comedy font sported by the Warwick and, for that matter, their sister restaurants the Moderation and the Queen’s Head. But on closer inspection there were definitely some changes. There were far less of the Thai specialities and some dishes had made their way across from the menu at the Queen’s Head, like rijsttafel (a sort of Indonesian smorgasbord, if that isn’t adding an unnecessary extra level of Swedish complexity to a dish that already has both Dutch and Indonesian roots). So, was it a new restaurant? I was still none the wiser. Perhaps the best way to find out was to compare like with like: much as I wanted to start from scratch myself, making a fresh start rather than retracing previous visits, I felt that opening with a mixed starter (the “Bar Platter”, in fact) was still the best way to try a range of Bali Lounge’s food. Besides, with Tampopo sadly closing down and Reading losing its fabulous sharing platter I was hoping to find a replacement here, especially now that the menu extends beyond Thailand. 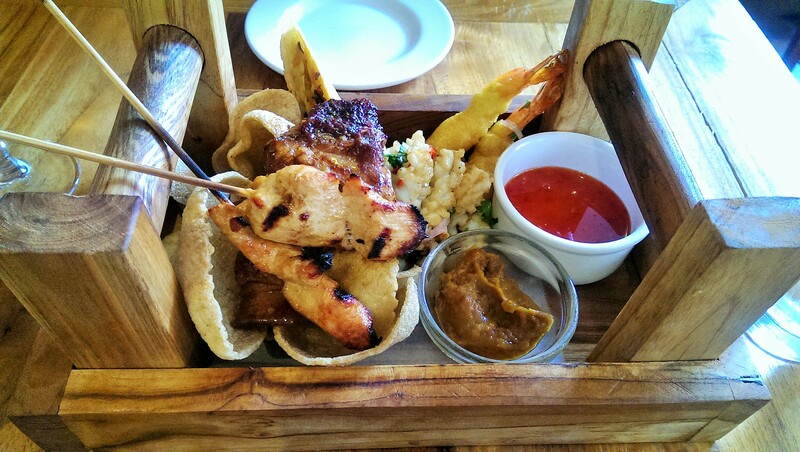 The presentation would have aggrieved people who want everything to come on a plate, but I didn’t actually mind it turning up in a wooden trug. The chicken satay was the first to go and was a hit, with moist chicken and a rich, savoury (if quite plain) satay sauce. A little basic, perhaps, but still enjoyable – and surely nobody really expects their world to be rocked by chicken satay. The spare ribs, though, were not good. The first one was a grim right angle of gristle where there was almost no meat and what meat there was clung on in a manner best described as Blatteresque. A shame, because the second rib was how ribs are meant to be – tender meat, sliding off with no work at all, at which point I got to appreciate just how sticky and tasty the sauce was. But by then, the damage was done. It didn’t get better. The crispy squid wasn’t. It was clearly fresh, but it was floppy and tasteless none the less. The only real flavour was the coriander dusted over it – if it had been coated in some seasoning and fried properly it could have been a knockout, but it looked more like fusilli than seafood. The saddest thing was that you got a lot of it – mouthful after mouthful of disappointment and wasted potential. The prawn fritters (or, to be more accurate, whole prawns in batter) were also forgettable – also a bit limp and again in batter with no crunch, salt or kick of any kind. It felt as if the chefs were frightened of using authentic levels of spice for our tender British palates and had erred way too far on the side of caution. Bali Lounge seemed to have managed the trick of turning from a pub to a restaurant and, at the same time, turning restaurant food into pub food. It didn’t bode well for the main courses, so we waited for them to arrive with rapidly lowering expectations. By the time the dishes turned up they almost met them. The best of the two was actually the vegetarian (hurrah!) 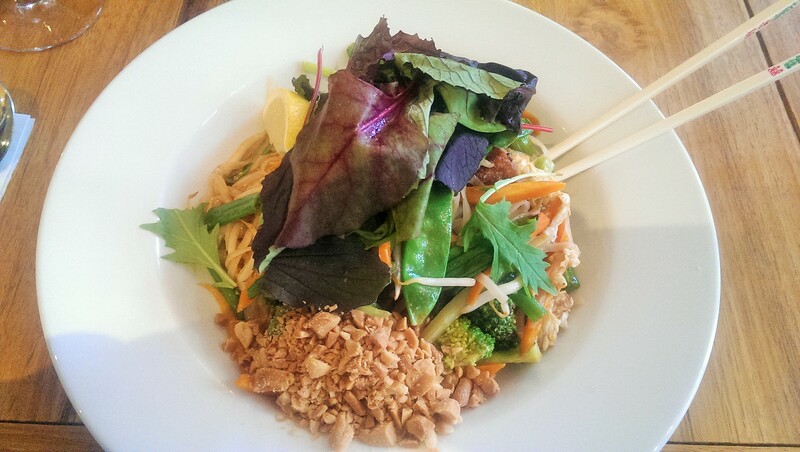 dish, the tofu pad Thai. This was still mind-numbingly plain but at least the texture was interesting. There was a decent amount of tofu, soft like cubes of scrambled egg, throughout the noodles. The carrots were cut a little larger than I expected (I have never been to Thailand so forgive me if this is the right way to make a pad Thai) and there were little florets of broccoli and the occasional mange tout in amongst the beansprouts which gave it a nice crunch. Then there was a hugely generous sprinkling of peanuts adding yet more texture. You’d think that would be enough, wouldn’t you? Apparently not, so we had a wedge of lemon as well, for reasons which escape me: all I can guess is that maybe they’d run out of lime. And, in case that wasn’t enough, a honkingly big pile of naked salad leaves had been dumped on top. Your guess is as good as mine. In the end they got pushed to one side and ignored, like tea drinkers in certain coffee shops. If I was trying to find something positive to say, at least it was healthy. But what it really needed wasn’t a slice of citrus or the contents of the salad crisper – it needed some soy, or some ketjap manis, or something that would have made it taste of something. It was hard to imagine being the sort of person who would eat this dish for fun, thank goodness. 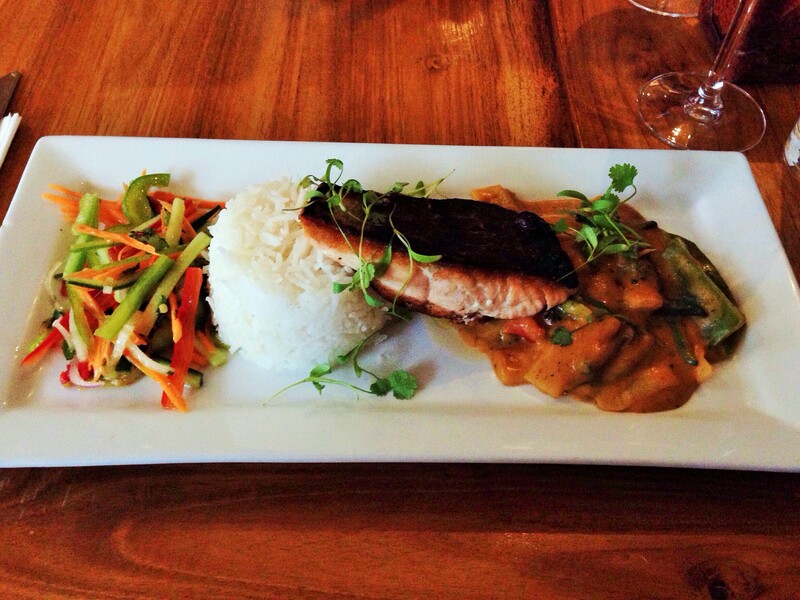 The other main was from the specials board – salmon with thick red curry sauce, courgette and green beans. I ordered this because I had happy memories of pla chuchi in other restaurants and again, wanted to see how it measured up. Well, on the plus side, the kitchen can cook salmon: lovely and firm with a crisp skin just the right side of blackened. A lot of places – Loch Fyne, for instance – get this wrong, so credit where it’s due. But again, the rest just didn’t cut it. The little pile of (unadvertised) shredded vegetables didn’t appear to be pickled or dressed so I am guessing it was the Thai equivalent of a salad garnish. The red curry sauce was one of the duller ones I’ve had, with a bit of acrid heat but no real sweetness; I expected better, based on the satay sauce I’d had earlier. The courgette and green beans were a bit thin on the ground. The rice was there to make up the numbers. If this dish had done the “which Star Wars character are you?” Buzzfeed quiz, it would have come out as Blando Calrissian. The wine was nice but inoffensive; a decent Australian shiraz and a Chilean chardonnay were both less than five pounds a glass. I have run out of words to describe how things taste – which is ironic given that I’ve used so few in this review, but I enjoyed the wine more than the food. The service was also nice but inoffensive – the young lady doing the majority of the serving was very quiet but friendly, food was brought at about the right speed and plates were cleared efficiently. Nice. Inoffensive. They’re not words that are ever going to feature in a mission statement, are they? The bill for two people – two courses each, two glasses of wine each – came to fifty-one pounds. If I was describing the value for money, I guess I’d say it was inoffensive. With hindsight, I wish I’d gone for the rijsttafel and the beef rendang: reading through the restaurant’s website it’s clear that the management decided to rebrand the place after recent trips to Indonesia, and it suggests that they’re really passionate about the food of those countries. But, in the predominantly Thai food I ordered, it feels like they’ve thrown the baby out with the bathwater: I didn’t get much zing or spice when I was expecting my food to be absolutely crammed full of both. My socks remained firmly unknocked-off throughout: it felt like the kind of Asian restaurant I could take my mum to, and much as I love her that’s really not a compliment. The thing is, my predominant feeling in writing this review is one of sadness. So, is it a different restaurant? Yes, I’m afraid so. Without a doubt, it has to be Café Yolk-gate. This happened back in November 2013 when ER hadn’t been going for very long and, to be honest, really didn’t have many readers. Most of my reviews came out to a ripple of ambivalence, the sound of one hand in two minds about whether to clap or not. And when I went to Café Yolk and thought it was a bit pants I thought there might be some response – it’s very popular on Twitter and it was (and remains) very good at mobilising huge amounts of support on TripAdvisor. What I couldn’t have expected, though, was Jeff. Jeff pitched in shortly afterwards to tell me what utter nonsense I was talking. He’d moved to Reading recently and, after extensive research, had stumbled on exactly what he was looking for – Café Yolk! It was his Mecca – second to none on the quality of its breakfasts, sourcing its fantastic sausages from the same people as Selfridges and Liberty’s (the latter being a place which doesn’t actually sell food, although Jeff didn’t seem to know that), the paean of praise went on and on. I just said that Yolk was very lucky to have such a devoted customer and that they should give Jeff a job. But something about it didn’t add up, so I checked the email address that was attached to the comment. And then I put it into Facebook. Lo and behold, it turned out that Jeff really did know a lot about Café Yolk… mainly because he was working there. As a chef. What are the chances? A few other people also wrote glowing defences of Yolk in the comments and I guess we’ll never know if they too were on the payroll. Anyway, it sort of went viral on Twitter – maybe not viral, maybe just mildly contagious – and, for the first time ever, I had Actual Readers. So not only is it the funniest reader-related thing to happen to me (although I do have a soft spot for the couple of times when I’ve had conversations with people about Edible Reading speculating on who the mystery author might be), but I also owe Jeff a big debt of thanks. Without his intervention, you might not be reading this now. The best Indian restaurant in Reading, that I’ve found, is House Of Flavours. But the best curry I’ve had in Reading is Bhoj’s karahi lamb. Go to Bhoj if you’re a creature of habit, and House Of Flavours if you’re a fan of variety. In terms of a 180 degree turn, no. I think you can visit a restaurant on a bad night or a good night but, ultimately, it’s still generally either a bad restaurant or a good restaurant. But one of the vagaries of visiting just the once, writing a review and giving a mark is that over time, restaurants can reveal themselves as better, worse or just different to how you originally saw them. So for instance, Bhel Puri House is definitely better than I thought it was when I first visited. Each subsequent visit has made me feel a little bit luckier that Reading has it as an option (and even more so now it’s taking advantage of the sunlit courtyard outside the George Hotel, perfect for a summer weekend lunch). Similarly, I wish I hadn’t been quite so hard on Sapana Home – granted, the momo were about the only thing I liked there but repeated visits have made me realise just how corking they are, and I’ve since found another couple of dishes worth ordering. That also sometimes happens further up the price bracket. A second visit to Ruchetta made me feel like I’d been a little unfortunate when I went there on duty – a lazy weekend lunch there was delicious, particularly the perfectly cooked tuna with caponata. The converse applies, too. I had a great meal when I went to Sushimania, on a week night. If I’d been on a busy Friday night and got increasingly drunk waiting for some – any – sushi to turn up, as I have a couple of times since, it would have been a very different story. My Kitchen was lovely when I paid it a visit on duty, but a couple of poorly toasted sandwiches, still cold cheese in the middle, have slightly changed my opinion since. I’ve thought many times about whether I should mention subsequent visits at the end of the review, when I go back. But I’ve decided against it. They’re snapshots, not a definitive chronicle, and the further back in the past the review is, the more caution you need to exercise. Anyway, paying them a visit every year would make me like a Michelin inspector, and I couldn’t be a lot less like one of those. I absolutely adore the stuff. Spread nice and thick on a slice of buttered toast, it’s what makes Sunday mornings a gastronomic highlight of the week regardless of anything I’ve eaten in the previous six days. My favourite bread for this is M&S’ “Super Seeded” bread – an inappropriate name, as I doubt it ever will be. It absolutely has. It’s depressing how badly thought out (or not thought out at all) vegetarian offerings are on menus. You get one, two at most and they usually revolve around pasta, risotto and cheese. That’s it. What always strikes me is how few of them involve doing intelligent, interesting things with vegetables, when vegetables can be as delicious as any meat. Only a couple of weekends ago I had a big plate of tenderstem broccoli, heaped with intense, nutty romesco sauce and with a huge slow-cooked duck yolk on top of it. Mouthwateringly gorgeous, totally vegetarian but – and this probably goes without saying – not ordered anywhere near Reading. Reading’s restaurants need to get better at this, because vegetarians have just as high standards as the rest of us (even higher, you could argue) and they are badly short changed right now. The only place I can think of to exempt from criticism is Mya Lacarte, which usually has two top quality vegetarian starters and main courses on the a la carte menu. But apart from that, it must be pretty bleak for vegetarians much of the time. I almost never pick a restaurant for a vegetarian review without checking the menu first and being almost certain what I’m going to order, and it makes me realise how lucky I am the rest of the time that I can rock up and find several things I could gladly eat. There’s no sure-fire sign, but I like to think in the last couple of years I’ve got better at having a decent idea before I ever go through the front door. So for instance I would say that a website is a good indicator (I still remember The Lobster Room’s website, with its “sweet chilly sauce”), but the truth is many Reading restaurants have appalling websites or decent websites they never update and a limited understanding of how Twitter can help them inform potential customers. I also think menus are key – some menus just read well. They show that a kitchen knows how to put both flavours and words together (not those really annoying ones that are just lists of ingredients, like Chicken. Asparagus. Morels. Lemon Thyme. Cillit Bang, that sort of thing). Other menus look like a slog, and if the menu looks like a slog the food is likely to be as well. That’s before we get on to the real affectations, like stating the patently obvious (hand-cut chips, pan fried salmon) or Dickensian capitalisation (Hand Cut Chips, Pan Fried Salmon). You get used to deciphering a menu, but nothing is 100% reliable. Look at Papa Gee: it looks a bit grim from the outside, the website is a horror show and the menu feels as long and meandering as a walking tour of Tuscany. Everything about it should be disastrous, and yet it was one of the nicest meals I’ve had this year – and (to answer a separate question from Alison Swaddle) probably the best pizza in Reading. This is a close-run thing. In the red corner, there’s Tutti Frutti. In the blue corner (literally just round the corner from Tutti Frutti), you have Shed. Now, on paper Tutti Frutti should win: they have the best ice cream and the best milk, and part of the battle is your raw materials. But TF’s milkshakes often feel like a way of getting less ice cream for more money – and some of their ice creams, delicious though they are, are just too hard to make a decent milkshake. For me, Shed edges it because they’re just better at making milkshakes: they get that it all has to be blended, they get the proportions right and they get the presentation right (in a milk bottle, provided you aren’t taking it away). Two straws – one for me, and one for me. When I think of all the restaurants Reading has lost over the years, it’s a bit like that bit in the BAFTAs where they play the doleful piano music and you see a black and white montage of recently deceased thespians. It’s a sad old parade – from recent closures like Cappuccina Café with its delicious banh mi, replaced with a(nother) nail bar to old-timers like Platters, which in its time was a smoke wreathed pleather seated retro wonder where you could drink milky coffee from a plastic beaker and eat the best double egg on toast in town. And, of course, the most recent closure – Tampopo, going at the end of this month so the Oracle can realise its insatiable desire for more rent and raise the tone of the neighbourhood by lobbing in another branch of TGI Fridays. Lucky, lucky Reading! I was tempted to say that my favourite closed restaurant was LSQ2. It had so much going for it – some beautiful dishes that could almost have given fusion cuisine a good name (I still daydream about the sashimi grade tuna on a rich, sticky pool of sesame-infused sauce) and, in its day, the best breakfast in Reading. But it wasn’t quite right: the space was too big, some of the food was inconsistent, the live acoustic music while you were eating the aforementioned breakfast was just a tad bizarre. So no, the place I miss most – and I’ve rhapsodised about this before – is Chi. Back when it used to occupy the spot opposite TGI Friday it was the perfect example of a restaurant you would go out of your way to visit. Wayne was one of the most charismatic owners you could hope to come across, and he’d created such a brilliant buzzy place that you quite forgot you were on a roundabout next to the sorting office at the less fashionable end of town. And the food! Salty-sweet crispy smoked chicken and salad. Big slabs of pristine cod topped with the most intense black bean sauce you could imagine. Plump firm prawns coated in the lightest batter and glazed with chilli sauce. That was the heyday – later, he moved to a spot on the parade of shops opposite Bhoj, and after that to the old converted pub next to Central Swimming Pool. And you always sensed that the glory days were past – and it felt a bit sad seeing people traipse in and pick up bags of takeaway, because Chi’s food deserved to be eaten there and then, on porcelain, at a table, with a crisp white napkin on your lap waiting to get spattered. Then one day Chi wasn’t there any more: I heard Wayne packed up and moved back to Wales, taking a little bit of my heart with him. But even at the end, the food – terrific as ever – was always big. It’s just the rooms that got small. I’d rather not name names: let’s just say that those Häagen-Dazs adverts back in the 90s have a lot to answer for. Loch Fyne closed in February 2018. I’ve left the review up for posterity. I’m probably as surprised to be writing a review of Loch Fyne this week as you are to be reading one. But it occurred to me recently that, despite it having been here in Reading for as long as I can remember, I’ve almost never visited. I’ve been to the branch in Henley, on the smart side of the market square, and had a light lunch in their sunlit courtyard (before going to the Rewind Festival, as it happens – nothing quite like the poignancy of hearing Johnny Hates Jazz performing “Turn Back The Clock” now Clark Datchler actually wishes he could). And I’ve been to the one in Oxford, a beautiful, big stylish space, the roof a mixture of beams and gleaming shiny pipes. But I always forget about the Reading branch, down by the canal, the wrong side of the Oracle on the edge of the Holybrook estate. Like the others, it’s beautiful from the outside – a lovely large redbrick building overlooking the Kennet (it used to be a brewery, apparently) with a terrace out the front which many Reading restaurants must envy. But stepping inside it’s a different story: the tables and chairs are starting to look a little tired and the stairwell that runs through the centre of the building makes some of the tables on the ground floor a little dark and stranded. I know this for a fact because, despite many tables being unoccupied on a weekday evening, the waiter decided to plonk us at one of the dark, stranded ones. My fellow diners got to look out on the remains of the daylight on that terrace, or gaze out across the river, whereas I got a view of the disabled toilet. Lovely. The options were, as you’d expect, mostly fish based (“from the sea” according to the menu, just in case you didn’t know) but with a few meat dishes (“from the land” – I know, it’s pretty educational stuff). In fairness, Loch Fyne’s meat supplier is Donald Russell, the excellent Scottish butcher, but it seemed only right to stick to the fish dishes as that’s what Loch Fyne is famous for. After all, nobody goes to Nando’s and orders the “Prego Steak Roll” – not anyone I’ve ever met, anyway. So if you really don’t like fish, this review won’t be for you I’m afraid – and now you know how vegetarian ER readers feel three weeks in every four. 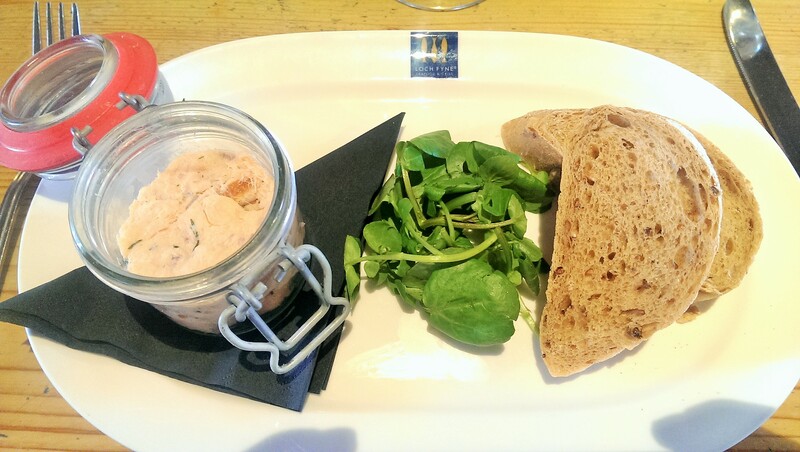 The first starter was the special – potted Bradan Rost (Loch Fyne’s own trademarked hot smoked salmon) with watercress and granary toast. Now, I think of a potted dish as being spiced and topped with clarified butter, delicious spread on decent bread. This was, sadly, more like mashed, cooked salmon with dill added, popped in a glass jar and then chilled. It was potted, I suppose, in the sense that they’d put it in a pot (in the same sense, in fact, that my main course could have been described as “plated fish”). The Bradan Rost itself was tasty – rich and smoky with a firm flesh – and I probably would have liked a fillet of it which hadn’t been mucked around with. But when it was mashed and spread on dry bread it was far less appealing. Some butter for the toasted bread would have rescued the situation somewhat, although of course if it had actually been potted salmon this wouldn’t have been a problem. Oh, and the watercress was the final nail in the coffin – a little pile of green in the middle of the plate that looked a little like it had been run over. Vegetarian roadkill – the perfect finishing touch to any dish. 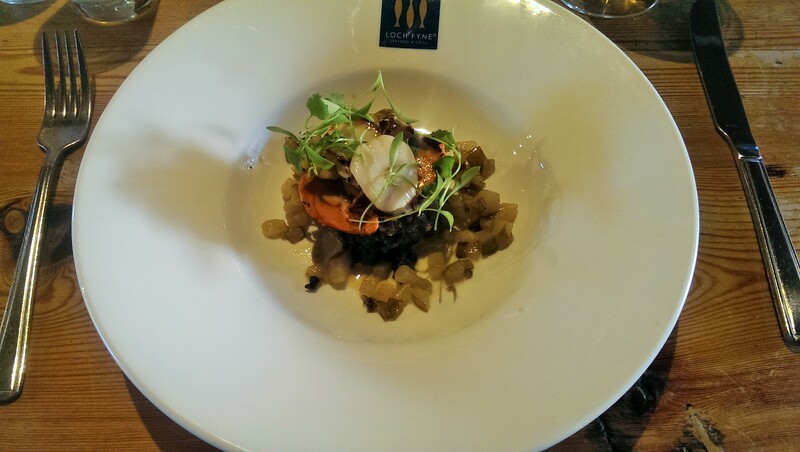 The other starter was described as “haggis with scallops”. This was also misleading to an extent verging on cheeky; I counted the grand total of one scallop, cut thinly into three slices (although that did make the coral, which I don’t usually enjoy, surprisingly tasty). Maybe they expect people to be fooled by this sleight of hand: I wasn’t. The kitchen’s knife skills were equally evidenced by the caramelised pear, although I did feel it wouldn’t have been asking too much for them to peel it first. It was pear all right, but it didn’t feel especially caramelised. You needed a similar ability to cut things into very small pieces to make the starter last very long. It was a tasty, pretty little thing (you never go far wrong with haggis), even if the lemon beurre blanc wasn’t really anywhere to be seen, but the whole thing prompted an overwhelming feeling of Is that it? followed shortly after with another of Is that it for eight pounds? It felt like the kind of starter you could only truly enjoy on an expense account. We had a glass of white wine each with the starters: a nice, if unremarkable picpoul de pinet and a zesty South African chardonnay, both of which were decent but not quite as cold as they should be (there was a certain symmetry to that, as my feelings towards the restaurant weren’t as warm as they should have been). By the end of the starters, which came out pretty quickly, we had got most of the way through the glass and had to decide whether to order another. We guessed that the mains wouldn’t take long to arrive so decided against a second glass. I didn’t get a huge amount of satisfaction out of being proved right, but sometimes the only certainty in a restaurant is that disappointment is lurking around the corner. Of the mains, the first – poached smoked haddock on colcannon mash with a soft poached egg and a wholegrain mustard sauce – jumped out from the menu because it ticked so many of my boxes. I know it doesn’t sound like summer food (although, so far, it hasn’t much felt like summer) but I fancied something comforting and I couldn’t imagine anything better than poached fish and mash. It was pretty – a huge mound of steaming hot mash, a decent sized piece of smoked haddock (undyed, as you can tell from the photo) and a perfectly poached egg oozing sunshine yellow on to the rest of the dish. It all sounds promising but, yet again, there wasn’t enough to like about the dish. The sauce round the edge had a skin on it, which suggested it had been sitting on the pass for a while, and it was oddly bland; if it hadn’t had mustard seeds speckled throughout it I’d have struggled to tell you what it was supposed to be. It should have been tasty and hearty, but the smooth texture of the mash (even with a few strands – nowhere near enough – of cabbage running through it), the gloopy nondescript sauce and the egg yolk added up to a big bowl of something like wallpaper paste. I polished off the haddock and left a fair amount of the rest. 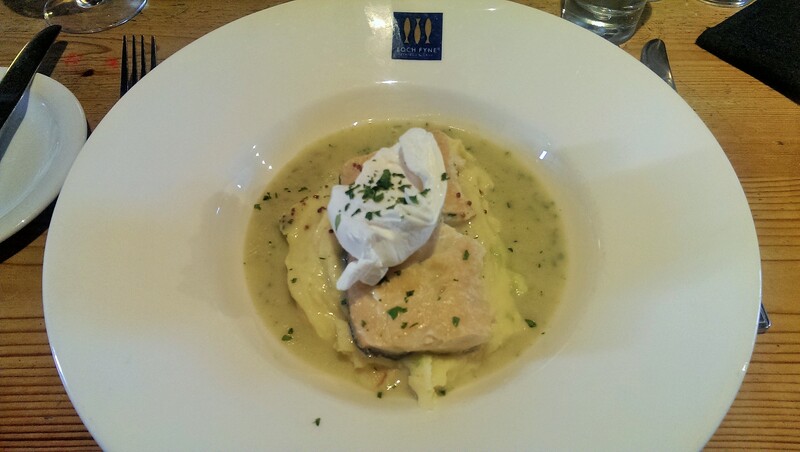 It seemed throughout the meal that Loch Fyne had really good fish, but little idea what to do with it. The second main was from the fish bar. A nice idea, this: you get a piece of fish of your choosing, grilled steamed or fried, with a sauce of your choice and two sides. My fried cod looked promising but again it was underwhelming – lovely thick flakes but no apparent seasoning and a soft, flaccid skin on top (which is the whole point of ordering it fried in the first place). 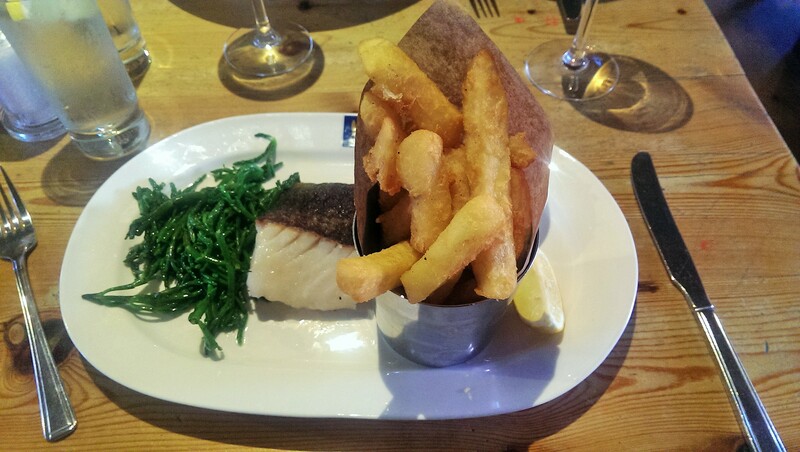 I would describe it as just hot enough – which made it considerably hotter than the samphire which accompanied it. Hot and well cooked, samphire is one of the most beautiful things you can pair with fish. Lukewarm and clumpy, it isn’t. I left a fair amount. Salsa verde tasted better than it looked – beautifully sharp and clearly made with lots of capers but the sludgy colours and coarse texture made it feel more like Boden mushy peas than the green, fresh sauce it should be. The best of the lot were the twice cooked chips, which were among the best chips I’ve had in Reading (only Forbury and LSB come close, from recollection). Beautifully crisp, rough outsides, lovely fluffy middles; if they’d just served me a portion of those, some bread and butter and some Heinz red sauce I’d have spent a lot less, left a lot happier and given a much higher score. They came in a metal beaker – because that’s how everyone serves chips these days, unless you get a tiny fryer basket – and at the bottom was a pale, unremarkable looking stowaway French fry. It reinforced the fact that this order was probably the only really good choice I made all evening. Aside from a friendly greeting at the door (by the manager, possibly) service was probably best described as apologetic. That was behaviour which made more sense as the evening went on: certainly by the end, there was a fair amount they could have apologised for. Not that I was ever invited to give any feedback which would have prompted an apology – tellingly, when clearing the plates away we were asked if we were finished but never if we’d enjoyed it. Even when the half full plate of wallpaper paste was collected there was no question or comment. Did they think that was normal behaviour from diners? Did they know the food wasn’t up to scratch? Or did they just not care? It was impossible to tell, but none of those explanations reflect well on anybody. We didn’t have dessert. I felt like Loch Fyne had had quite enough of my money by this point: the total bill for two courses and one glass of wine each was fifty four pounds, excluding tip. The whole experience took just over an hour, and diners were still turning up as I was leaving. I hope they had more fun than I did, although they could have easily managed that playing Scrabble or eating a packet of Quavers instead. I can never decide whether Loch Fyne is an upmarket chain or not. I saw a fair few date nights taking place during my visit – a few sparkly tops (and one I might even describe as “ritzy”, with all the connotations that word carries) and smart jackets giving the game away. But I couldn’t help wondering, based on the evening, whether they might have been happier in Henley, Oxford or even Wokingham. Perhaps I was a bit jaded – after all, they’d spent the evening gazing into each other’s eyes and I’d spent it looking at the door of the disabled loo. But I think maybe what Loch Fyne really illustrates is that not only are there good chains and bad chains but that, despite the promise of uniformity implicit in a chain restaurant, there are also good branches and bad branches. And Reading, I’m afraid, is saddled with the latter. You might get a better deal if you turn up for the thirteen pound, three course, not hugely exciting set menu. But really, why would you bother? The one thing I’ve learned from Loch Fyne isn’t where fish come from, it’s that – where restaurants are concerned – there are plenty more of them in the sea. I’ve talked about Shed many times since starting this blog. For instance, when I reviewed Artigiano I remember saying “I’d rather go to Shed”, or words to that effect. They won my Sandwich Of The Year award in December for their truly splendid tuna melt (and I’m reliably informed that a number of people stopped by to check out my recommendation). And, returning the favour, proprietor Pete recommended I check out Beijing Noodle House: and I’m delighted that he did, because it turns out that that man knows his mouth watering pork dumplings when he sees them. And yet I’ve never reviewed Shed. Silly, really. I suppose I’ve always assumed that everyone knows about Shed, that they’re part of Reading’s lunch royalty and require no endorsement from me, but thinking about it this week I realised that was no reason not to go. After all, ER is about celebrating the good places, banging the “use it or lose it” drum. Why should Shed be an exception to that rule? Besides, Shed are specialists in one of my favourite things of all, and that’s the humble sandwich. I know the world of lunch has diversified, and we’re all supposed to enjoy our bread free salad boxes and our floury tortilla wraps and – please, God no – “quinoa pots”, but I still think there’s a lot to be said for a truly decent sandwich. I was tempted to say that it’s the best thing since sliced bread, but really it’s the logical culmination of sliced bread. A properly excellent sandwich, you could say, is sliced bread v2.0. In my book, a sandwich should be made to order rather than sitting clammy in a fridge waiting to be bought, and not enough places in central Reading offer that nowadays. That Shed has developed such a devoted following (I still remember seeing the pictures of Pete and Lydia at last year’s Pride Of Reading Awards, with facial expressions which roughly translated as What the hell are we doing here?) is particularly impressive when you consider the location. It’s tucked away behind Friar Street, itself the poor relation of Reading’s retail world, and the uninitiated probably stop at Nando’s before ever walking the extra few steps to discover it. That’s their loss, because it’s a lovely spot: the building is a barnlike structure that used to be a forge, with a serving and seating area downstairs and a large open space upstairs with beams, mismatched furniture (including the classic Robin Day polyprop chair which takes me right back to secondary school) and a bar for when it turns into Milk in the evenings. The space upstairs is my favourite – it has a certain dishevelled charm to it, and tons of people watching potential if you manage to bag a seat with a good view out of one of the floor to ceiling windows. The menu offers sandwiches, toasties and salads plus a soup each day and a few specials during the week. It saddens me greatly that I’m very rarely in the centre of Reading on a Friday when Shed does “Saucy Friday”, but it’s well worth trying if you’re more fortunate than I am (and if you are, hold out for the Scotch bonnet chicken with rice and peas, coleslaw and macaroni cheese – a finer hot lunch for six pounds you’ll struggle to find anywhere). Still, visiting on a Saturday is the next best thing – no specials, but the office hordes aren’t around (it gets absolutely packed on weekdays) and the shoppers are elsewhere. In one of our countless Caffe Neros, probably. Our toasted sandwiches, rationally speaking, didn’t take that long to arrive. It felt like an eternity, but that was probably because I caught the smell of melting cheese wafting up the stairs before they even reached our table (or maybe it was just an olfactory hallucination brought on by the cravings). First up was “The Top One” – mozzarella, chorizo, jalapenos and sun dried tomatoes. I don’t know whether it got that name because it’s their most popular, their best or just for the prosaic reason that it’s at the top of the menu, but whatever the reason is I really liked it. The jalapenos were generous enough to give some fire but at the same time added a touch of sweetness and the little batons of coarse chorizo were rich and salty. 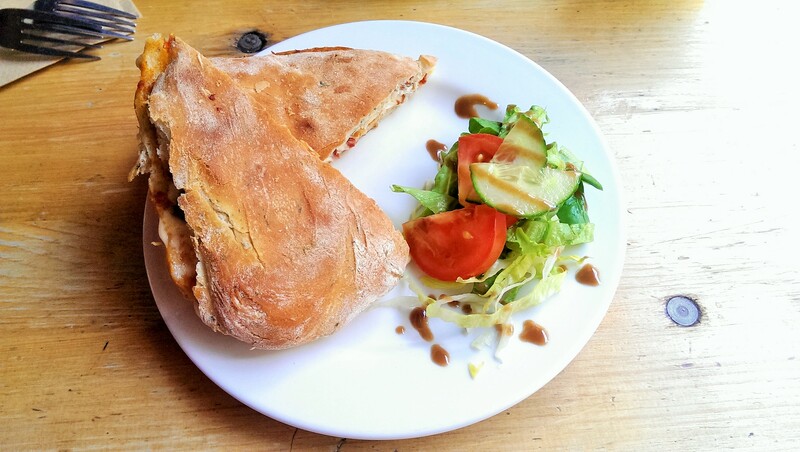 I had it on ciabatta – it costs a little extra but the ciabatta at Shed is a truly wonderful thing, big, deceptively light and so much nicer than the slightly miserly panini you might get in Reading’s chain establishments. The only drawback was that there wasn’t quite enough cheese for my liking (which does raise the question of how much cheese is enough cheese? Based on extensive research, I’d sum my conclusion up as a hell of a lot) which made the sandwich a touch dry in places. I don’t remember seeing Pete or Lydia behind the counter that day, and perhaps that’s why it wasn’t quite as good as usual. I probably should have ordered something other than the tuna melt to accompany that. Partly for variety’s sake – the menu offers a range of different salads, some with pasta, some with couscous, some just with leaves (it also has a Barkham Blue cheeseboard, with some money from each one sold going to Launchpad) so to pick another sandwich felt a little unimaginative. Partly, too, because I’ve already waxed lyrical about this particular sandwich. But when push came to shove, I couldn’t resist reacquainting myself with it. Was it as good as I remembered? Well, almost. It looked perfect; just enough tuna, shedloads (pardon the pun) of cheese, the occasional piquant mouthful of thinly sliced raw red onion. The only disappointment was the capers – I’m used to these not being spared at Shed, a carpet of capers scattered throughout the sandwich making every bite a tangy delight, but this time they’d been used sparingly and it just wasn’t the same. Don’t get me wrong: if I’d never had the tuna melt before I’d have been very pleased with it indeed. But I had, and the problem with excellence is that people have a nasty habit of expecting you to keep it up all the time. Again, I wondered if I’d just picked the wrong day to show up. Both sandwiches came with a little salad – iceberg lettuce, a little lamb’s lettuce and some slices of cucumber and tomato, dressed with a little balsamic vinaigrette. It divided opinion: I finished mine (even though I do think the only place for iceberg lettuce, really, is in a burger) but my companion decided to give it a miss. On the side we had a cup of tea each, served in a decent sized mug with separate milk, like proper tea should be (I was surprised that my companion didn’t have a coffee, but apparently he doesn’t think it’s one of Shed’s strong points). We were tempted to have a piece of cake, just to give you a comprehensive review, but on this occasion we just weren’t quite tempted enough. Maybe next time I’ll give in and have a bit of the shortbread with lemon curd that nearly tipped me over the edge on this visit (and if there had been some of Shed’s chocolate tiffin the decision would have made itself, but it wasn’t to be). The whole thing came to just under thirteen pounds, not including service. While I’m on the subject of service, it was friendly and efficient if a little overwhelmed (I think we turned up during a bit of a lunchtime rush). Again, I’m inclined to be forgiving because I know it’s usually absolutely spot on, and it probably only looked a little frayed in comparison to that: I’m sure that the uninitiated, if they’d come here instead of Nando’s, would have found it terrific. Shed, more than anywhere I can think of, reminds me that there really are two Readings out there. On the one hand, there’s the Reading where Shed is unknown, where at best people say “I’ve always wondered about that place” or “I keep meaning to go there” and, on the other, the Reading where life without Shed is unthinkable. The latter Reading, I think, is the one that I write about and that Alt Reading writes about, the one we all queue up to defend when unimaginative people call it a clone town, usually from the comfort of Costa Coffee or Bill’s (the same people, I find, who complain – equally vociferously – that nothing ever happens here and that Reading is a cultural desert). Well, I’m sad for them – but, more than that, I’m glad I live in this Reading: we don’t need Starbucks, because we have places like Shed and it’s our Costa, our Starbucks, our Caffe Nero and Central Perk all rolled into one. And as long as they keep toasting the ciabattas, melting the cheese, dishing up Saucy Friday and making their milkshakes (can’t believe I nearly forgot to mention the milkshakes!) I’ll keep coming. I have a sneaking feeling I’ll probably see you there, some time.